Top marketing firm PTPA Media today announces the latest round of recipients of the Parent Tested Parent Approved Seal of Approval. The results come after a thorough product approval process whereby families (selected from a community of over 75,000 families) put products to the test in the context of their daily lives. "Ask any mom about how she chooses which stroller to buy, which food to give her child, and which toys to buy and she’ll tell you she trusts other moms more than brands or ads," said Sharon Vinderine, President and CEO of PTPA Media. “Today’s Moms say they’re not satisfied with the way brands speak or market to them. More and more they are turning to online reviews from their peers for purchase considerations,” added Vinderine. "Authenticity is the only currency that matters, and that comes from the assurance that other moms have experienced a product personally, and found that it met or exceeded their expectations. PTPA’s Seal of Approval conveys this all at a single glance." 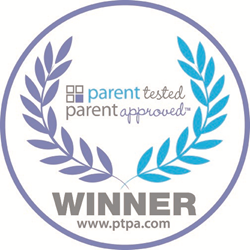 "At PTPA Media, we are proud to play a role in certifying innovative products that families can trust," says Sharon Vinderine, Founder & CEO of PTPA Media. "It's a win-win. By improving communication between manufacturers and consumers, we are helping companies serve their market better, and helping families identify products that have been tested and recommended by their peers." For more information visit http://www.ptpamedia.com.